Welcome to Sam Thatte Presentations! Why is it so difficult to remember a presentation just minutes after the speech is over? The reason is simple. It is easy to forget the information presented if it is not very interesting. And we would much rather sit through an interesting presentation than a boring one. Imagine that your local area has had a major Tsunami and the events have been video taped for posterity. When the video gets produced, one version is named, “Environmental impact of the Tsunami- A documentary on how the Tsunami affected our environment”. 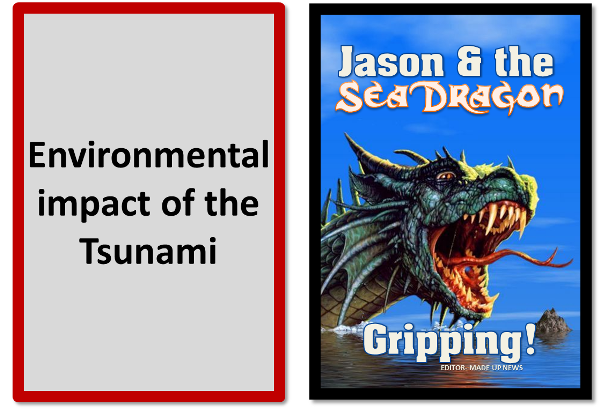 The second movie, is titled, “Jason and the Tsunami – Man Vs the Sea Dragon- We thought we were just having some bad weather!” Which one would you rather see? Almost all of us would choose the latter. Who wants to see a boring documentary when we can see this exciting movie? The information you will get from the movie will be the same as the documentary but will make it fun and interesting so that we can remember and apply that knowledge effectively. What helps the brain remember stuff? When we are taking in information, our brain does that best if the communication channel comes with triggers that help the brain to remember. If I asked you to memorize the following letters “DMVC BSIR SMVPU SSR” you would have a hard time remembering it. But if I rearranged the same letters into something that you can create a memory trigger with, you would have a much easier time remembering it. So are you finding this easier to remember, “DMV CBS IRS MVP USSR”? I will bet you are. These are the same letters as before but just arranged differently. Knowing what the acronyms stand for, gave you a trigger with which you remembered the information. I am on a quest for knowledge on how to communicate better using presentations and speeches that motivate action. Too many presentations and speeches are dry and boring. My goal is to help visitors get a better understanding of how they can make their messages stickier so that the audience at their next presentation will be influenced and persuaded to take the actions that you want them to take. Be it, buy your product, fund your idea or help you to get achieve success at your job. There are a lot of websites on the internet that give you tips and tricks on how to present better. There are some amazing people that have taught me how to get better at presenting and I will never be able to pay them back . Heck, not in a hundred years! This is my way of paying it forward. Yes, I will be seeking business and sales on this site but there will always be free content, tips and tricks that you are welcome to! This is great information! As a sales trainer and speaker on the topic of risk and insurance, I’ll be sure to employ this “less is more” approach in the future. Having been guilty of offering more than just a hint of information while presenting with the aid of Power Point, this topic speaks to me directly. Thanks for sharing such relevant information in a cool and creative manner! 4 reasons to subscribe to the newsletter! Why should you subscribe to my newsletter? Well, there are four reasons. I will have service, product and workshop offers that will be available to the subscribers at a discounted rate. That alone should be reason enough. I take a lot of pride in my work and will always strive to put out material on this website that will educate you, inform you and/or entertain you. I have written a report on the How & Why of Presentation titles! Using this report, create a great title for your presentation! And the rest of the content will practically write itself! Every so often, I release a really good PowerPoint template that you would end up paying $50.00 or more if you were to purchase it. You get those here for free! So take a look around, familiarize yourself with the site and head over to the contact page if you think of a question to ask. I am here for you. In case you are looking to hire me for my services I might be the right person for your job, but then again, I may not be! Click here to see what I can and cannot do for you! And if you would like to get some questions answered about your presentation project, go ahead and schedule a free 30 minute consultation with me! Not sure if this report is for you? Click here for more information! Dress like a boss! It really matters how you dress for a presentation! Communicating Abstract Concepts- How to Find a Great Image that says “Customer Service”. Another Free Gift for my Subscribers! The Transition Conundrum! No audiences left behind! Does anything on this website bug you? Nothing is too small or too big. Click here to report a Bug! If there is something I can fix, I'd love to know. In fact, I will give a free PowerPoint template worth US$50 for the best bug every month!